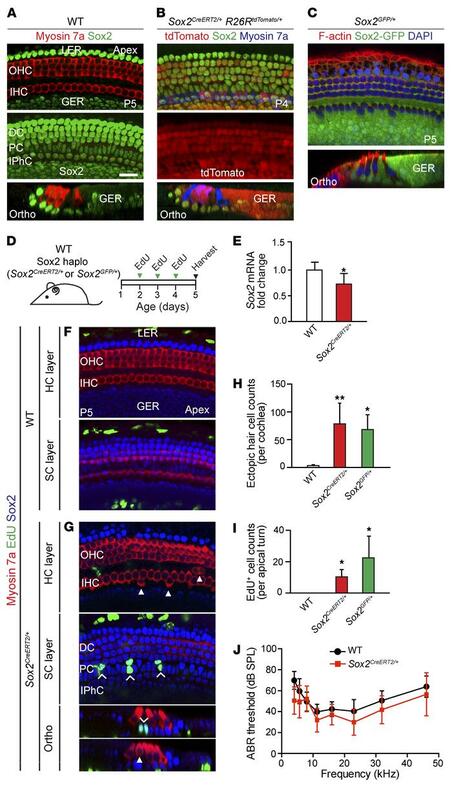 Sox2 haploinsufficiency results in continued proliferation and formation of supernumerary hair cells in the neonatal cochlea. (A) Immunostaining of P5 WT cochlea shows Sox2 expression in Hensen’s cells, Deiters’ cells, pillar cells, and the lateral portion of the greater epithelial ridge. (B) Whole-mount preparation of cochlea from P4 Sox2CreERT2/+ R26RtdTomato/+ mice given tamoxifen on P2, showing tdTomato expression in supporting cells and some hair cells. (C) GFP+ supporting cells in the P5 Sox2GFP/+ cochlea. (D) Schematic of EdU administration to Sox2CreERT2/+ mice, Sox2GFP/+ mice, and WT littermates (once daily, P2–P4). haplo, haploinsufficient. (E) qPCR showed a significant reduction of Sox2 expression in Sox2CreERT2/+ cochleae compared with expression in WT littermates. (F) Confocal images show no EdU+ hair cells or supporting cells in the P5 WT cochlea. EdU labeling was seen in cells in the lesser epithelial ridge and greater epithelial ridge. (G) Sox2CreERT2/+ cochlea contained occasional extranumerary hair cells adjacent to inner hair cells (arrowheads). Extranumerary hair cells were noted in all cochlear turns of Sox2CreERT2/+ mice. Image shows EdU+ supporting cells (chevrons) in the apical turn. No EdU+ hair cells were noted. (H) Quantification of extranumerary hair cells in WT, Sox2CreERT2/+, and Sox2GFP/+ cochleae. (I) Quantification of EdU+ cells in WT, Sox2CreERT2/+, and Sox2GFP/+ cochleae. (J) P28 Sox2CreERT2/+ mice had normal ABR thresholds, comparable to those of their WT littermates. DC, Deiters’ cell; GER, greater epithelial ridge; HC, hair cell; IHC, inner hair cell; IP, inner pillar cell; IPhC, inner phalangeal cell; LER, lesser epithelial ridge; OHC, outer hair cell; OP, outer pillar cell; Ortho, orthogonal view; PC, pillar cell; SC, supporting cell. Data represent the mean ± SD. *P < 0.05 and **P < 0.01, by 2-tailed Student’s t test. n = 3–8. Scale bar: 20 μm.